These inspiring presences are Hal Smith, co-leader, washboard; Marc Caparone, cornet; Kim Cusack, clarinet; Howard Miyata, trombone; Katie Cavera, banjo; Georgia Korba, bass; Carl Sonny Leyland, piano. This wonderful music was captured for us by Rae Ann Berry at the Fresno, California, Sounds of Mardi Gras celebration on February 12, 2011. Another jazz gift from some brilliant musicians, ably captured by Rae Ann Berry! MKG and Friends, on February 6, 2010, at the Sounds of Mardi Gras in Fresno, California. That new acronym, translated, adds up to MARC Caparone, cornet; KATIE Cavera, guitar; GEORGIA Korba, bass; along with Mike Baird, alto sax; Chris Tyle, clarinet and vocal; Ray Skjelbred, trombone; Jeff Hamilton, drums; and Carl Sonny Leyland, piano. They were intended to perform as a trio, but this happy aggregation just grew, in a friendly way. The overall ambiance reminds me of a late-Thirties record session (the Varsity Seven with Benny Carter, Joe Marsala, Coleman Hawkins, and George Wettling), or a Lionel Hampton Victor, perhaps a Keynote band — the same loose, groovy feeling. Two of the musicians are happily and ambitiously playing instruments they aren’t always associated with: Ray is well-known on piano, Chris on trumpet and drums. But their knowledge and love of the music comes through powerfully. Speaking of “powerfully,” might I suggest that readers who aren’t on the West Coast or who aren’t familiar with his work need to pay close attention to Marc Caparone, whose hot playing is a highlight of this set and of the New El Dorado Jazz Band. Rough or polished, intense or pretty, he’s a great trumpet player, subtle or driving. He loves the obvious Masters, but you’ll hear a good deal of those glorious eccentrics Red Allen and Jim Goodwin in his ferocities. And I’ve singled out the nifty Jeff Hamilton for praise at other times in this blog — but he’s having a wonderful time here, getting the sounds out of a drum kit that say Swing Is Here. Here is a spirited reading of Walter Donaldson’s MY BUDDY, originally written as a lament — but that was before Hawk (in France) and Hamp (in the US) latched on to it. Wow! Here’s another lament, defined by Katie Cavera as “the saddest song” she knows — NOBODY CARES IF I’M BLUE. It’s not true, Katie — we would worry about you if the lyrics were true. Could we make you some soup or a cup of tea? I delight in her girlish angst, as if Annette Hanshaw had somehow found herself in the Vocalion studios circa 1937, and in the ghosts floating through this performance — not only Pee Wee Russell and Red Allen but Sandy Williams or J. C. Higginbotham. DO YOU EVER THINK OF ME reminds me of Vic Dickenson, who liked it, and of Jon-Erik Kellso, who continues to do so. A rocking performance of a sweet old tune, it has the sound of a Condon Town Hall Concert — with Jeff’s splashing cymbal summoning up Mr. Dave Tough, his accents suggesting Wettling or Catlett. “Groovy!” I thought to myself, in its pre-1967 meaning. You could look it up. NEW EL DORADO JAZZ BAND 2010: MARDI GRAS COMES EARLY! 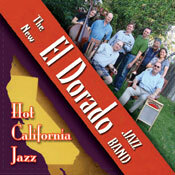 Thanks to the energetic Rae Ann Berry, who took her nimble video camera to Fresno, California on February 6, 2010, for the Sounds of Mardi Gras (sponsored by the Fresno Dixieland Society), here are some lively videos of the New El Dorado Jazz Band, co-led by Hal Smith (on washboard) and Clint Baker (clarinet, banjo, vocals, and more) with Howard Miyata on trombone, Marc Caparone on trumpet, Mike Baird on clarinet, Katie Cavera on banjo, Carl Sonny Leyland on piano, Georgia Korba on bass — with a guest appearances by singer Dawn Lambeth and the multi-talented Jeff Hamilton. Here they are on a romping BIG CHIEF BATTLE AXE, which Dawn once told me they called (privately) BIG CHEAP CADILLAC, a title I much prefer. Now the secret is out! And a nearly dangerous ONE SWEET LETTER FROM YOU, with Howard and Jeff continuing. This band delivers the mail for sure. This band has recorded a CD for Clint’s BURGUNDY STREET RECORDS: if you’re lucky enough to see members of the band on gigs, I’m sure they’ll have some, and Hal Smith promises that it will soon be available through his website. (http://www.halsmithmusic.com/hals_cdpage.html.) I’m buying some copies! Does anyone have the lyrics to ORIENTAL MAN? Or the original sheet music to share? P.P.S. For no reasons aside from personal pleasure, I’d like to know the “reach” of this blogpost. Who’s watching these clips from far, far away? A prize to the most distant viewer . . . !